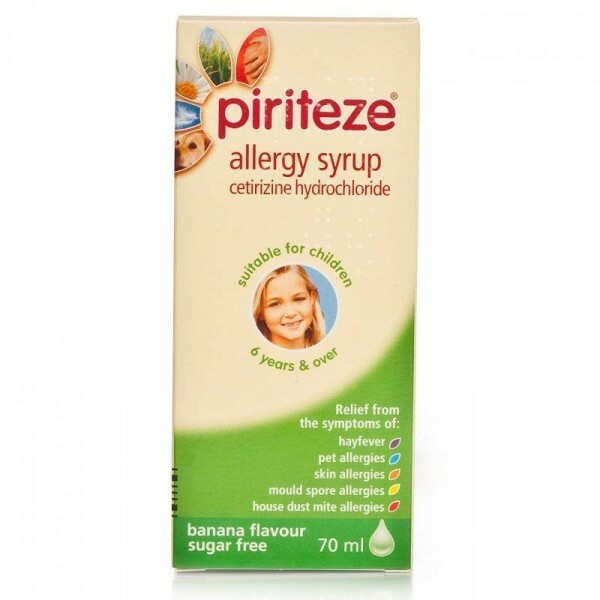 Piriteze Once A Day Allergy Syrup provides once a day relief from the symptoms of hayfever and other allergies, such as pet and house dust mite allergies. 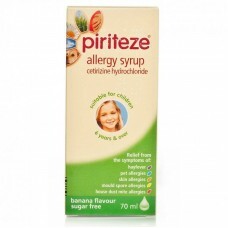 Piriteze Allergy Syrup is a clear, colourless solution. Each 1 ml of oral solution contains 1 mg of cetirizine hydrochloride as the active ingredient. What Does Piriteze Syrup Do? The syrup contains the active ingredient cetirizine hydrochloride. Cetirizine belongs to a group of drugs called antihistamines which help relieve the symptoms of some allergies and itchy skin rashes. The syrup is used to treat the allergic symptoms (runny or itchy nose with or without stuffiness) caused by hayfever and other allergies e.g. pet and house dust mite allergies. The syrup can also be taken to relieve the rashes and itching of chronic urticaria (hives). Urticaria can occur as a persistent condition and is recognised by the formation of raised white or reddish lumps surrounded by red inflamed areas which itch or sting. Many things in todays environment can trigger allergies in certain people. These include: Pollen Animals House dust mites Mould spores Some things are not triggers themselves but can make the effect of allergies worse. These include: Pollution Poor air conditioning Central heating / hot weather You can help reduce allergic reactions by avoiding contact with those triggers which you know cause you to react: If you suffer from hayfever try to ensure low exposure to pollen when hayfever symptoms are expected. For example, keep windows closed, do not cut grass and stay indoors as much as possible. Try to avoid contact with animals if they normally cause you to have allergic symptoms. How to take Piriteze Syrup: Adults and children over 6 years: 10ml once daily or 5ml twice daily Not recommended for children below 6 years.